Interior renovations are projected to be completed by January 2019. Students and families are within two miles of campuses such as DeVry University and Indiana Wesleyan University when they stay at the Country Inn & Suites, Merrillville, IN. After your college tour, make time to visit attractions like the Brauer Museum of Art or play some golf at Turkey Creek Golf Course. If you’re with the family, remember children 18 and under stay free in each of our comfortable guest rooms and suites. Traveling solo? Use our free Wi-Fi to share pictures of your Chicago-area vacation with everyone back home. Our facilities also include complimentary parking and a convenient on-site meeting space for up to 25 guests. 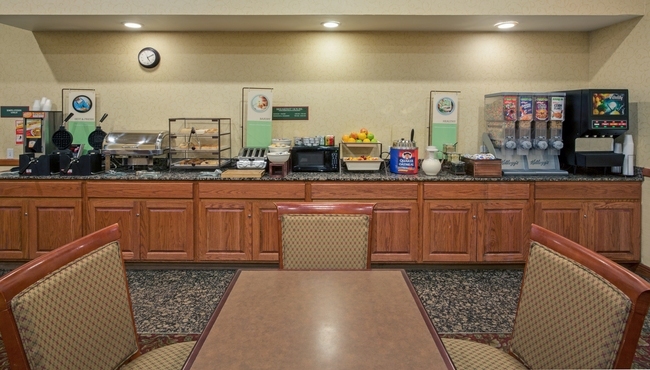 Served daily in our welcoming dining room, the free, hot breakfast offers morning favorites like yogurt, cereal, pastries and biscuits with gravy. Top a Belgian waffle with warm syrup and fresh fruit, or opt for a traditional plate of bacon and eggs. You can satisfy your lunch and dinner cravings later at nearby restaurants like Bob Evans or Gamba Ristorante.